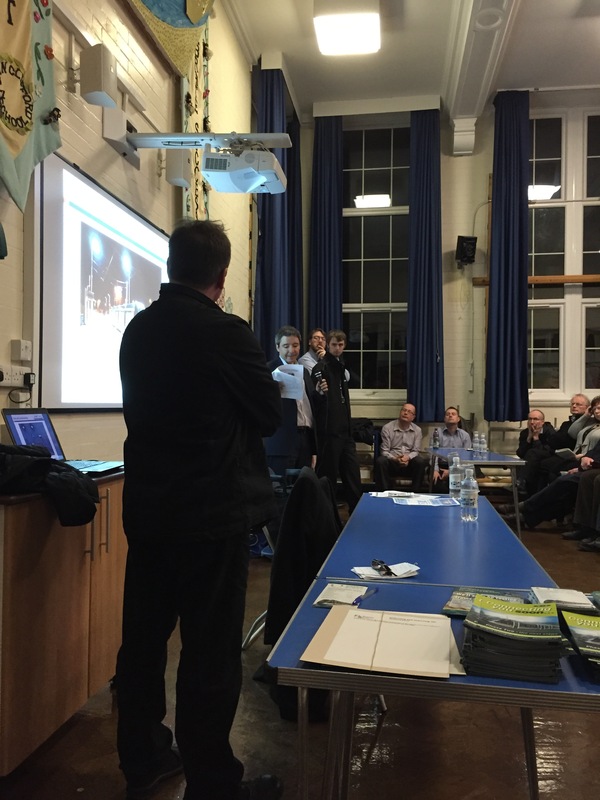 An overflowing audience listened with interest to seven representatives from ‘the Tramlink Team’, who gave a presentation of all aspects of the tram through design, construction, testing and forthcoming operations. Joining us were Graham Bethel, Project coordinator from Tramlink; Richard Horsley, Tramlink; Jamie Swift, Tramlink; Trevor Stocker, Nottingham Trams Ltd; Daniel Patterson, Nottingham Trams Ltd; Steve Tough, Notts City Council; Ashley Jackson, Taylor Woodrow Alstrom and designer Ignacio Sequeros Hernandez. Ignacio started by outlining the testing now taking place on the 22 new trams in the city, which are being run on existing lines. Most of the tram track will be completed very soon despite ongoing problems in a few locations eg. Gregory Street and Devonshire Avenue. The new communication system is being installed and the final overhead wires are being placed and tightened. Overnight testing on new lines will start soon and the tram will start to run as soon as these tests have been carried out. The latest estimate is ‘mid year’ as the tests on the trams, track, traffic control and communication system is complex. Trevor advised that 120 drivers have now been appointed and undergoing extensive training and scenario planning. Customer Service manager Daniel was introduced and we were told of plans for maximum support when the tram is up and running, with help points at every stop. Steve outlined that 85 small business have received support for troubles during construction and land compensation claims are being dealt with. The public hotline has taken 9000 calls and 6500 emails during the construction period. Jamie said trams will run 6am to midnight, 7 days per week, every 8-10 minutes. The tram from Beeston will not terminate in Nottingham, it is a full cross city service. Lots of information will roll out from Jamie’s team over the next few months. 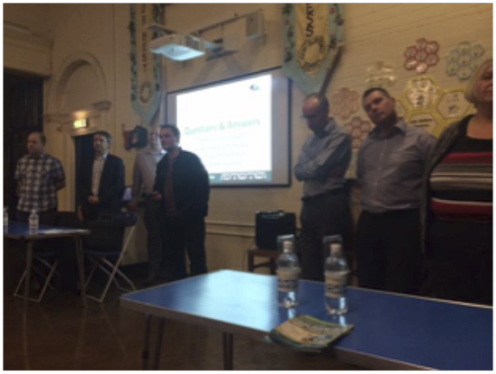 There followed a lively question and answer session, lasting about an hour, which dealt with both broad issues and more detailed queries. 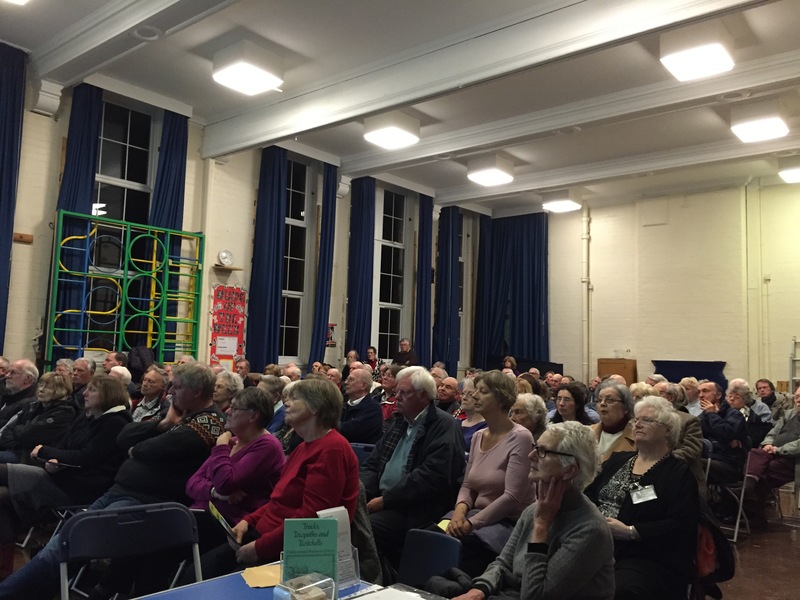 Various topics were covered, including individual junctions and barriers, compensation for residents, tree planting, grey pole ownership and traffic flow, some discussions leading to differences of opinion between some audience members. However I think there was a general feeling that we had been given a very helpful and comprehensive update. An Excellent report Karen, and, as I think I told the Tramteam at the time, much better than the Councillors Update that had been given about a fortnight ago at Loxley House.